These are my favourite Christmas cookies. We’ve been making these on my mother’s side of the family for at least four generations now. They aren’t a traditional Danish Christmas cookie, but my great-grandmother got the recipe in a Christmas baking leaflet (my mum still has the leaflet, it’s very old and falling apart). And we’ve been making them ever since, every Christmas. I can’t recall a single Christmas without them. They’re very, very buttery, and the recipe makes for a LOT of cookies. Last year I only made the chocolate chip variant, because everyone prefers them (they are really yummy) and they’re a lot quicker and simpler to make, but the pinwheel ones are just so darn festive to look at, I feel like I need to make at least one small batch each year. It’s tradition. This recipe makes for about 170 cookies. 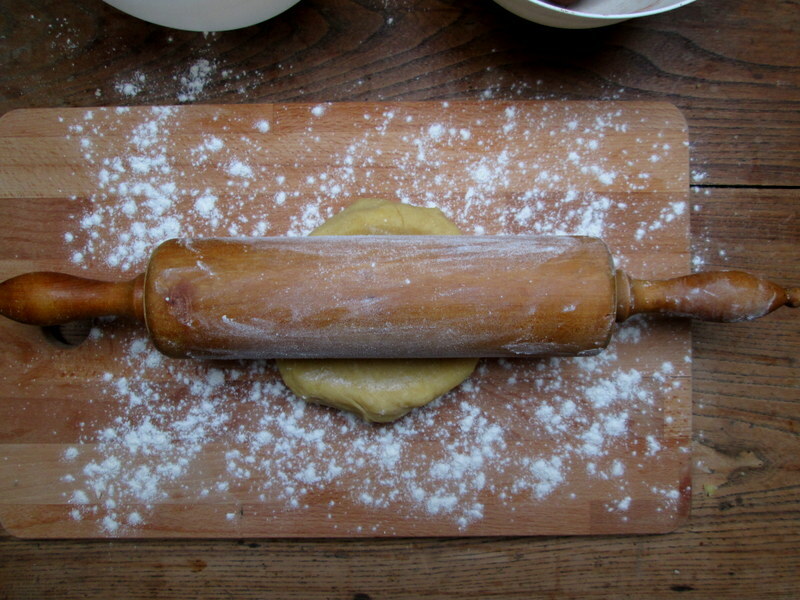 You don’t have to bake them all at once, the dough keeps very well in the fridge. 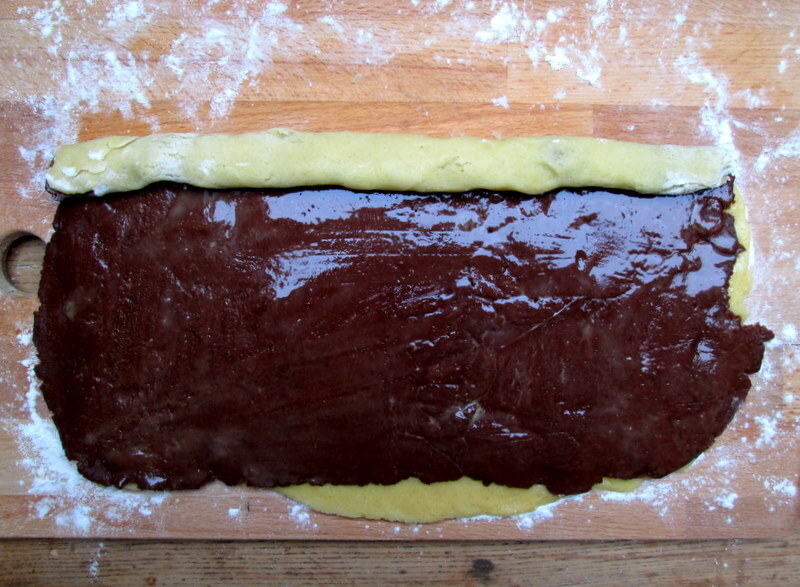 I usually make the dough, roll it into logs, and keep it covered in the fridge for about a week (sometimes even a tiny bit more), baking a couple of trays every few days. You can, of course, half the amount of ingredients, if you don’t want this many, but I find that I always end up giving some away when I go to people’s houses around Christmas, and we’re a big family anyways, so eating them all usually isn’t a problem. Besides, these are the amounts listed in the original Christmas leaflet, and who am I to monkey with tradition. Take the largest bowl you have. 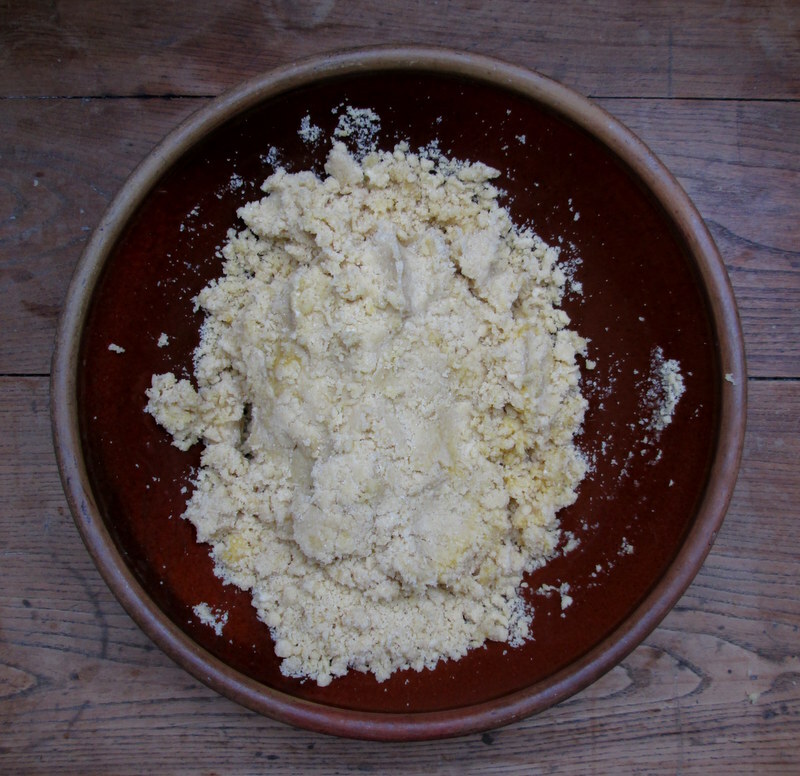 You’ll need a seriously big bowl for this amount of flour and butter. 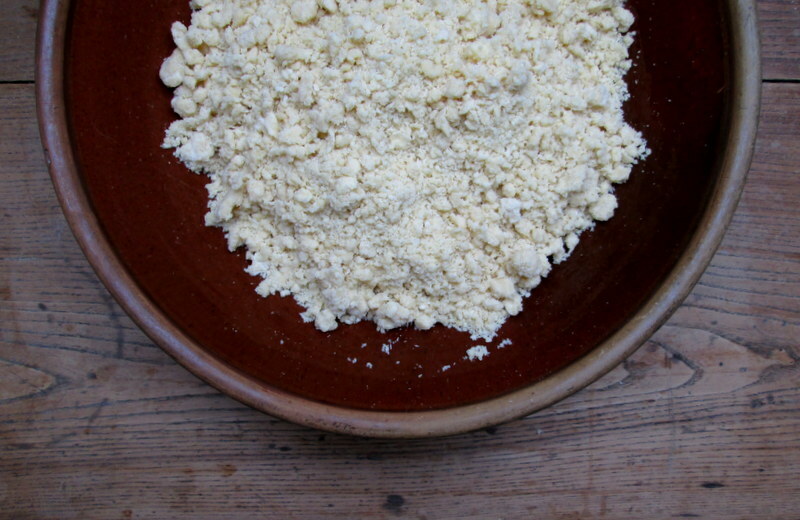 Chop your cold butter into smaller bits, then rub into the flour until you have something resembling coarse breadcrumbs. Stir in the sugar, then the vanilla. 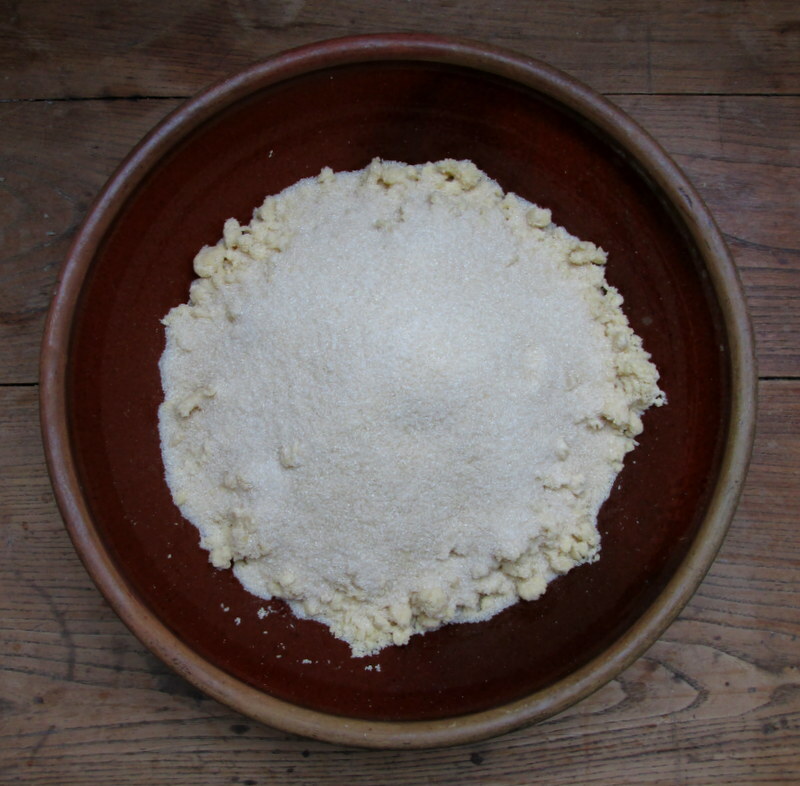 Add the eggs and mix them into the flour-mixture a bit with your fingers, then start to gently press together your dough. 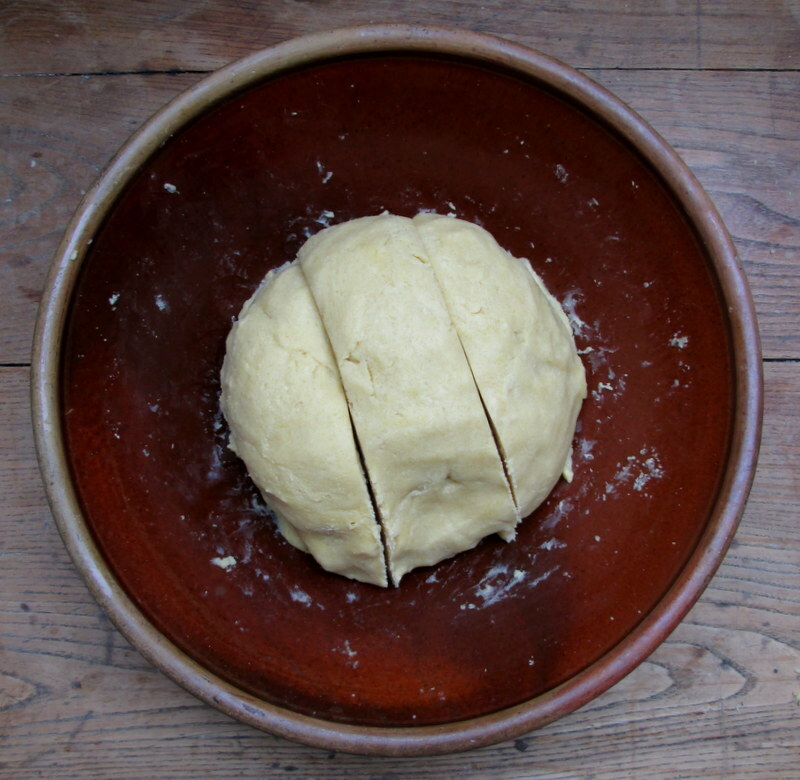 Don’t worry if it seems too wet/buttery, it will come together quite nicely if you just keep pressing the dough together gently with your hands, for a few minutes. 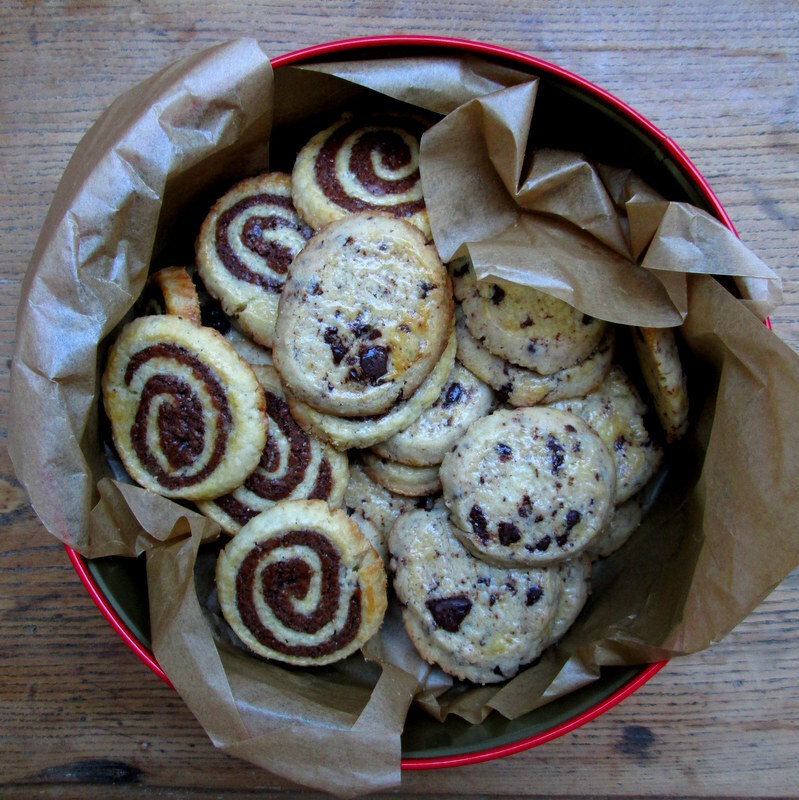 If you’re making the pinwheel cookies, slice the dough into three roughly equal slices in the bowl. If you want to make only chocolate chip ones, skip on ahead. 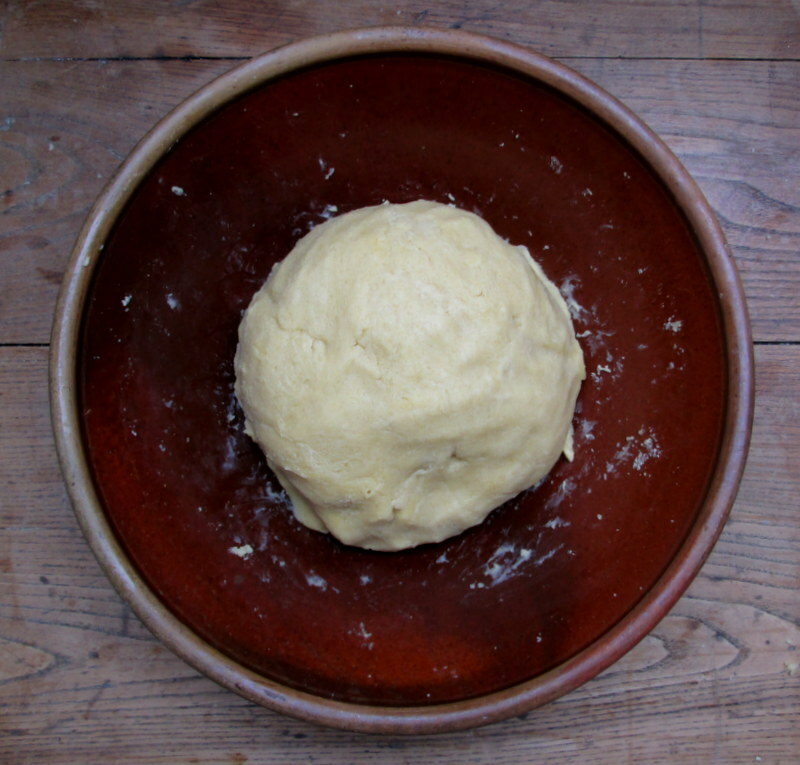 Take 1/3 of the dough. 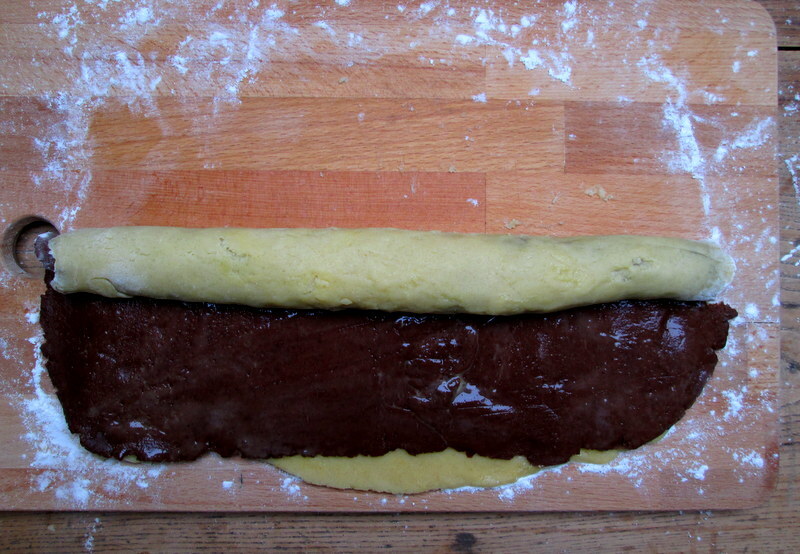 Divide it in half, one half slightly bigger than the other. 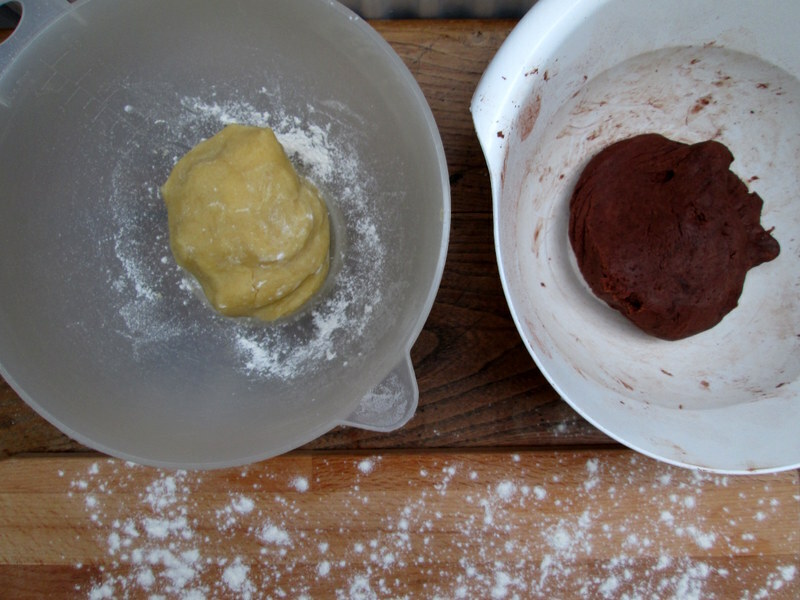 In a small bowl, add three tbsp of cocoa powder to the smaller half of dough, mushing it into the dough with your fingers until it is all absorbed. 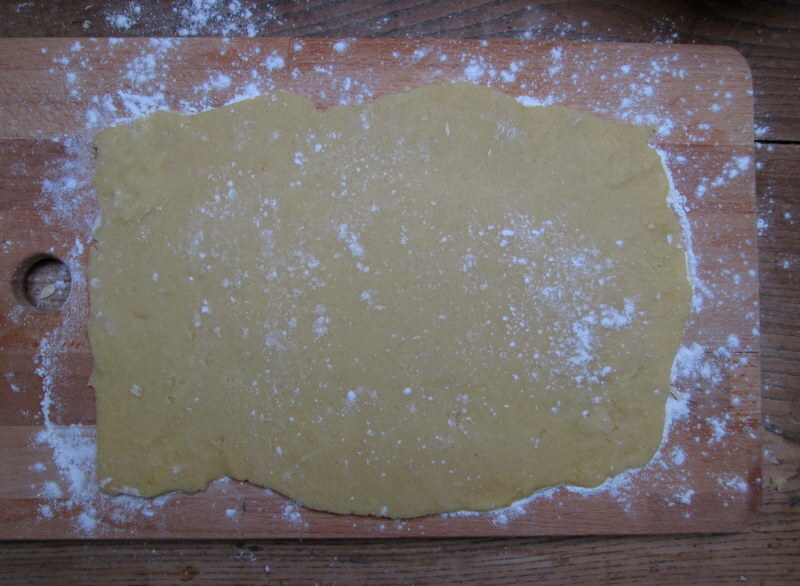 On a lightly floured surface, roll out your white dough into a rectangle, about 40 x 25 cm. Brush with beaten egg. 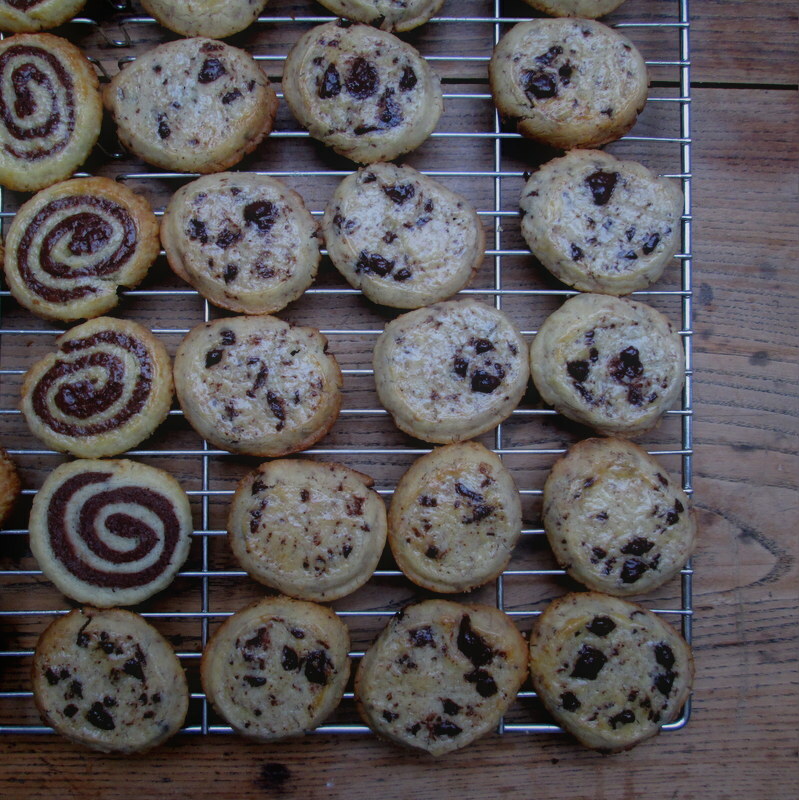 Roll out your brown dough into a roughly same size and shape; roll around your rolling pin, and transfer to your white dough sheet (this can be tricky, but even if it breaks and you have to patch it up a little, who cares if some of your pinwheel cookies look a bit more wonky than the rest – just eat those, and no one will be any the wiser). 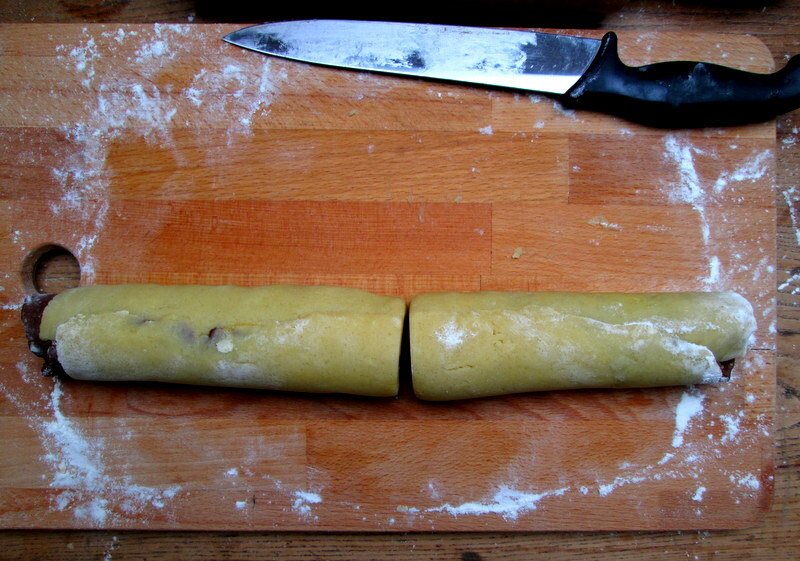 I usually trim the edges of the rolled out dough, to make for a more even pinwheel pattern, but this year I forgot! 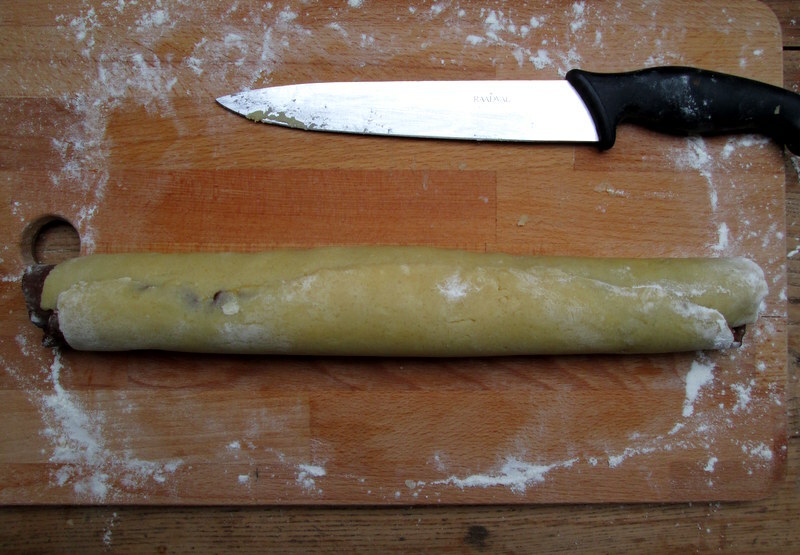 Brush the brown layer with beaten egg as well, then carefully roll your dough into a roulade, as tightly as you can. Cut in half, then gently roll into two logs. 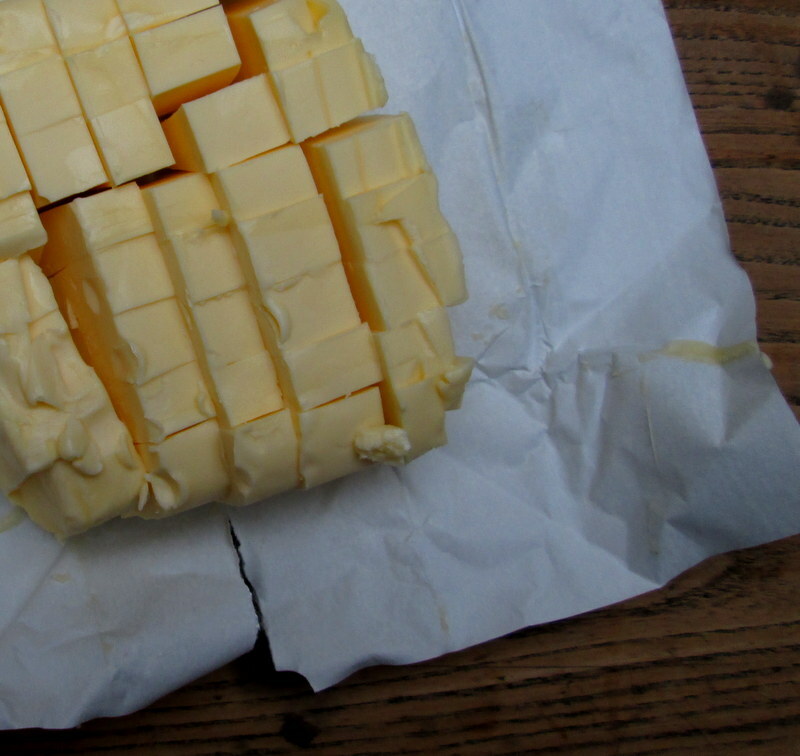 Place on a cutting board, cover in tin foil, and set to cool in the fridge for at least an hour, preferably a bit more. 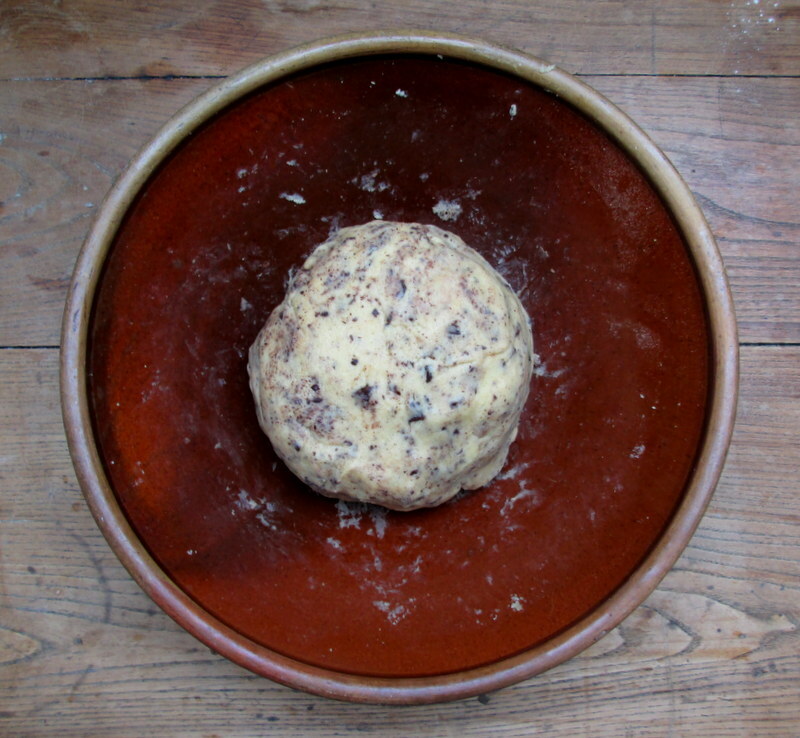 Put the beaten egg in the fridge to use later, when baking the cookies (unless you’re baking them on different days, then you will need to crack a new egg!). 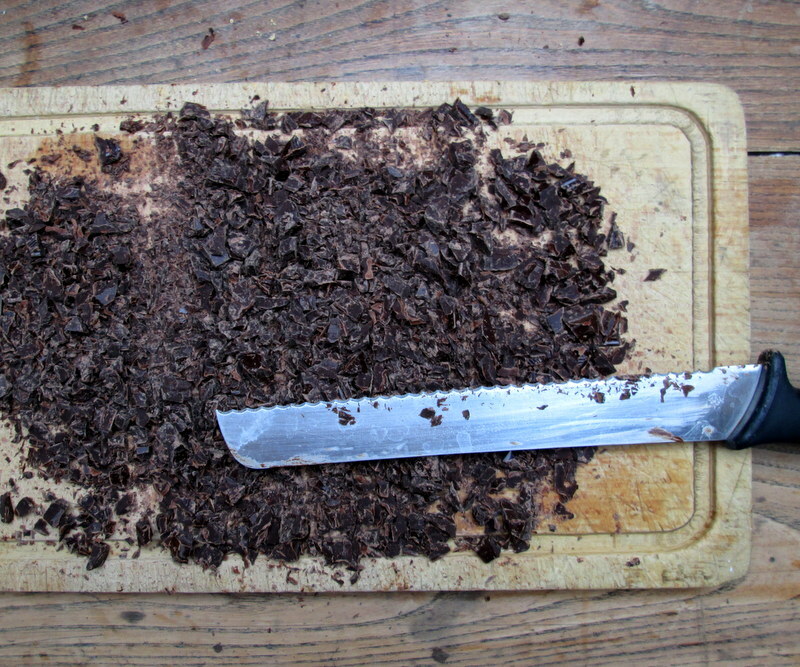 Chop the chocolate into fairly small bits (340 g if using all the dough, 225 g if using 2/3 of the dough). 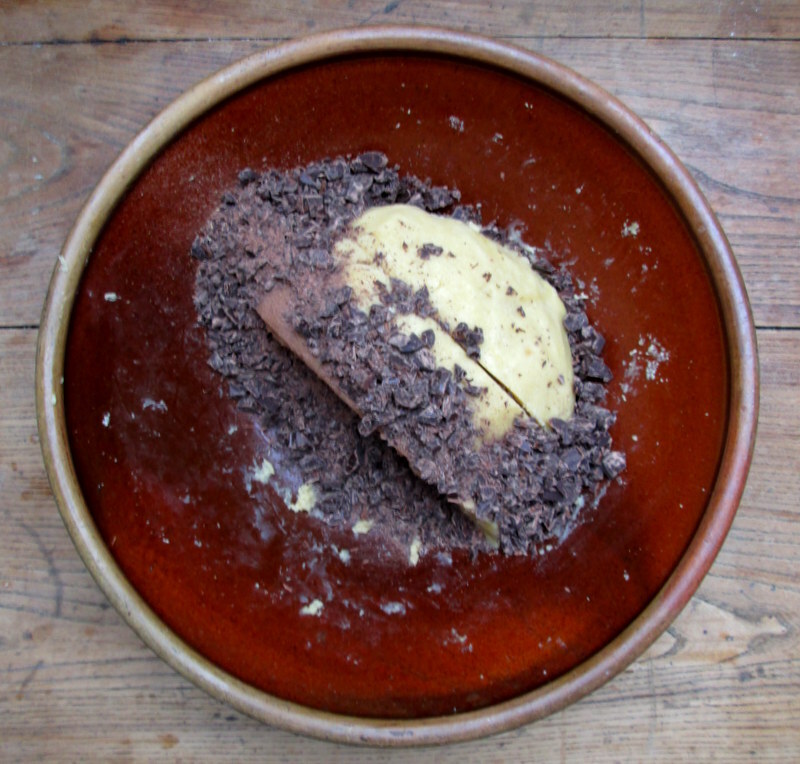 Add to the dough, along with any chocolate dust, and work with your hands until the chocolate chips have been incorporated into the dough. 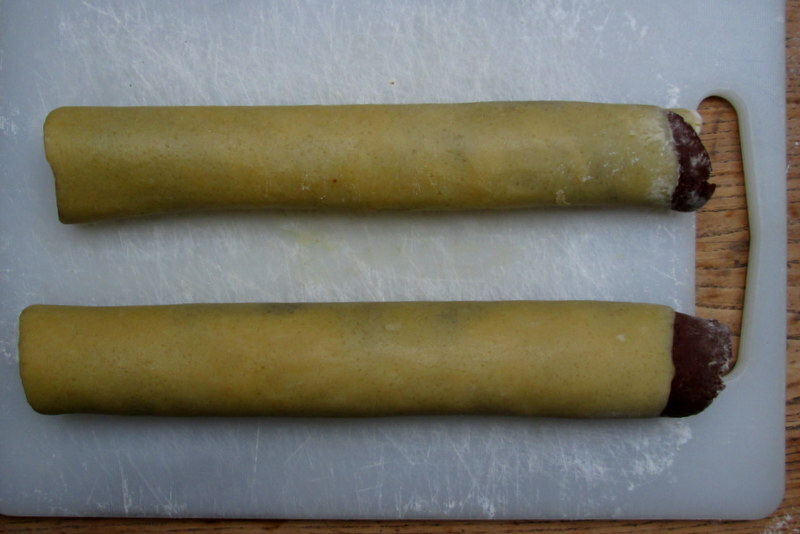 Roll into logs, place on a cutting board, cover in tin foil and put in the fridge for at least an hour, before cutting and baking. Grease one or two baking sheets. 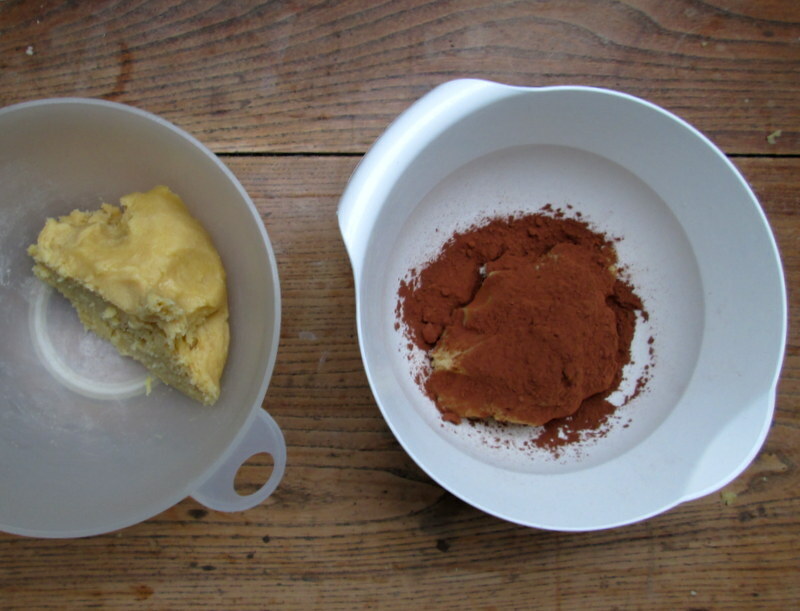 No need to re-grease the baking sheet between batches, one time will do. 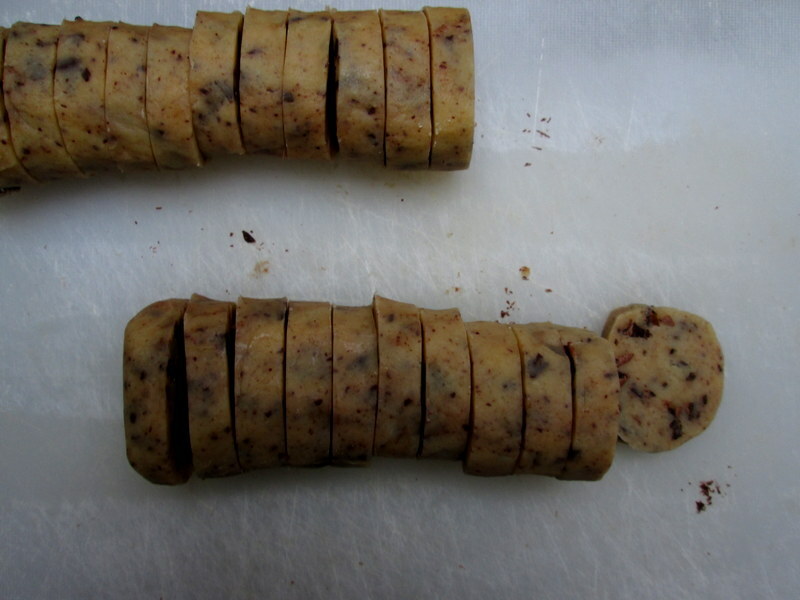 Slice the dough logs into 5 mm slices, and place on the baking sheets (sorry for the jumps between pinwheel and chocolate chip cookies – seems I was inconsistent in documenting the process 😉 ). 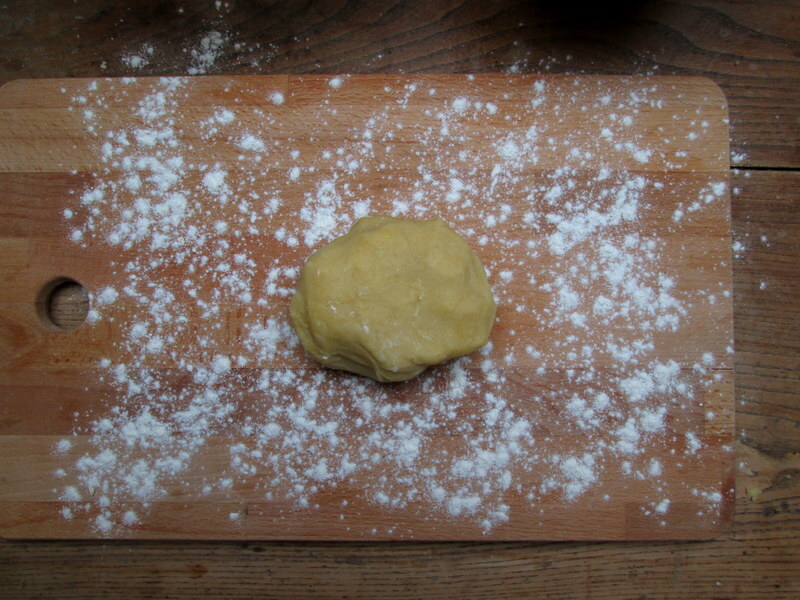 Lightly press down on each cookie with the ball of your hand to flatten it a tiny bit more, then brush with beaten egg. Bake for 5-7 minutes (depending on how dark you like them – I like them around the 6 minute mark, but as mentioned above, I make some almost burnt ones for my mum and aunt, baking them for 7-8 minutes. 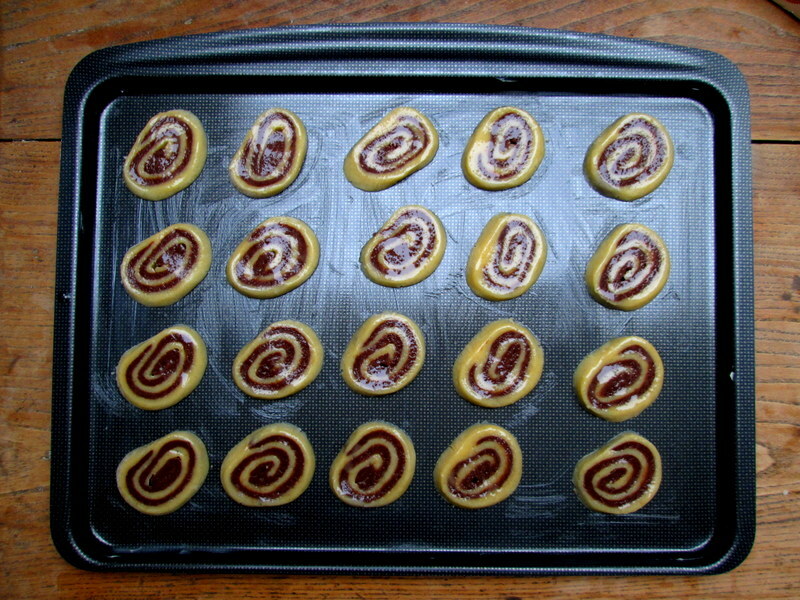 When done, leave for a minute on the baking sheet, then transfer to a cooling rack. Repeat the slicing, flattening and egg-brushing process until all of your cookies are baked 🙂 (or you can leave the logs of dough on a cutting board, covered in tin foil in the fridge, for around a week, baking them whenever you wish!). Store in cookie tins/airtight containers (if using a plastic container, be sure to line it with baking parchment to keep the cookies from getting soft). These keep till well after Christmas if there are any left, at least a month I’d say.